O+ Venti 4G is set to debut with 6-inch HD display and LTE connectivity. We have some exciting info about the handset before it becomes official. Check it out. O+ USA’s smartphone releasing streak certainly isn’t going to abate for a long while. Since the release of the O+ Crunch and the O+ M, the US brand is yet to release another unique handset inclined to capture the taste of screen real estate-loving users. After the elections, smartphone releases won't seem to slow down anytime soon. 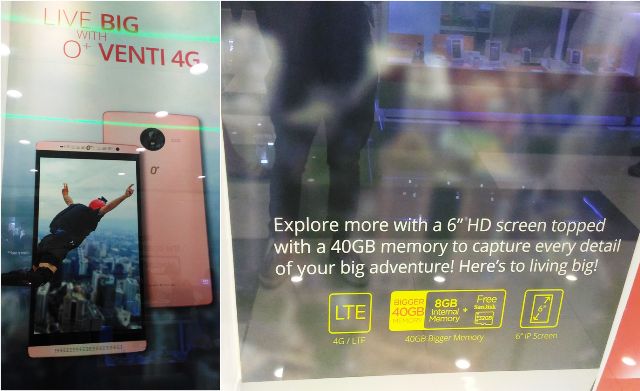 Framing its body in an O+ USA concept store in SM Trece Martires Cavite, the soon-to-be-released O+ Venti 4G made a charming spectacle for techie enthusiasts. The handset sighting gives us a clear point of view on what’s coming. For one, the O+ Venti 4G takes a wider shell that will house the humongous 6-inch HD display and the rest of the visual indulgence opens up for some interesting features. Design-wise, the O+ Venti 4G looks like an HTC-made handset with a front-facing speaker grill above and below the screen. The back panel showcases the camera lens and the LED flash inside a black-hued circle. Beside the camera module is the silkscreen of 8MP rating for the main shooter of the O+ Venti 4G. It’s also worth noting that the handset will pack a 4G LTE connectivity making it join the league of O+ Xfinit and O+ Evo 4G. And just like any other O+ device, the Venti also comes with a 32GB SanDisk memory card on top of the 8GB native storage. 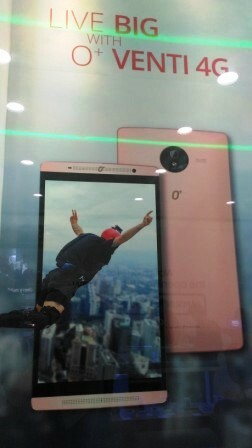 Interestingly, the purported phablet will have a rose gold paint-job which is quite popular these days. O+ USA is yet to unveil the full specs sheet of the Venti 4G which includes the RAM, chipset, battery, front facing camera and price. And as usual, we will give you the rest of the details once it’s officially launched.